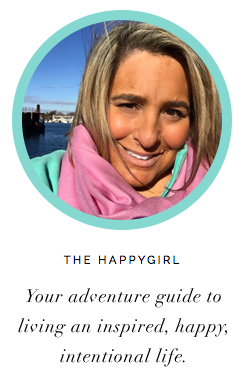 The call came from "Chef Joy." "Intermezzo*. Pears and Rosemary. Can I come over?" The answer is, of course, always yes to this question because with the question comes something that tastes and smells amazing. A few minutes later Chef Joy popped in with a full wicker basket. We threw on some Sinatra and Chef Joy taught me how to make a simple intermezzo course that would be appropriate for Thanksgiving or any other dinner which needs a simple, elegant nod. *Intermezzo is a palate cleanser that can be served between a salad and main meal or between the main meal and the dessert. It's basically a short break in the action. Pour grape juice into medium size pot and bring to boil. Remove stems and peel pears. Cut pears into chunky slices and remove any core/seeds from each slice. 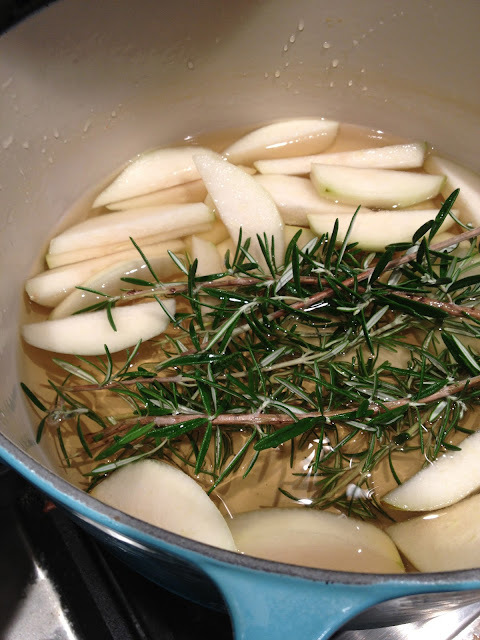 Add pear slices to boiling grape juice with 6 small sprigs (or 1/2 the package) of rosemary. Lower heat to simmer for 10 minutes until pears are soft. Remove pears from juice and set aside. Remove rosemary from juice and discard. Raise heat on grape juice and reduce juice by 1/2 until it becomes a thicker syrup. Serve pears in a small bowl with a drizzle of the reduced syrup. Can be served warm or cool. 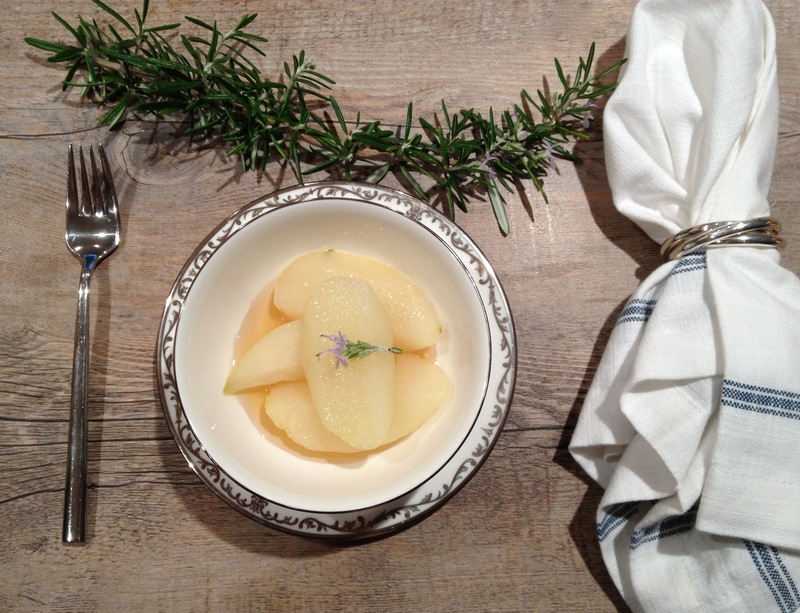 You may initially be turned off by the idea of rosemary with pears. I was but the rosemary seems to just amp up the flavor of the pears. It isn't too rosemary-ish. Try serving these warm over vanilla ice cream with chopped walnuts. Serve the pears warm over hot oatmeal for breakfast.